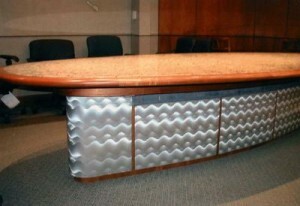 If you’ve seen photos of some of our work, you may be wondering where we get those gorgeous conference tables. New Orleans is home to many great designers and craftsmen – but there’s one artist in particular we turn to over and over for custom office furniture. Liam O’Brien is an integral part of The Office Planning Group team. We love to show off his pieces whenever we get the chance. Besides our decades of experience in office furniture planning and provisioning, it is connections in the design world like this that give our firm an edge over the competition. O’Brien is a native of Ireland (born in Dublin). But he’s been living in New Orleans for so long that he just seems like he belongs here. Since 1985, Liam has been involved in the furniture and construction trades in one form or another. From refinishing and refurbishing the works of furniture designers from bygone eras, O’Brien moved on to creating his own pieces. Galleries, private collectors and design industry connoisseurs all agree that the furniture Liam creates elevates the practical to the level of fine art. Of course, O’Brien is careful to give credit for inspiration where it is due. He turns to a source far older than the antique furniture he used to refinish to uncover ideas for his designs. 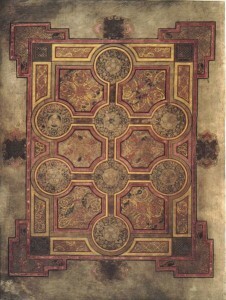 It’s the ancient illuminated text called the “Book of Kells” that sparks this award winning designer’s imagination. Just a brief look at some of the illustrations from that manuscript will help you understand how it can provide enough artistic inspiration for several lifetimes. You’ll definitely recognize the Celtic influence on O’Brien’s masterpieces – including some exquisite conference tables. New Orleans area businesses are lucky to have access to office furniture made by a master craftsman, and we’re lucky to have Liam on our team. Be sure to contact The Office Planning Group for your next custom project! Can Your New Orleans Cubicles Do Mardi Gras? Are your New Orleans cubicles being prepped for a crazy Carnival season? The round of Mardi Gras parades is already in full swing with full blown celebrations planned for February 12th this year. Of course, not all of your employees will be able to take time off to see all the action. So, why not bring the party atmosphere into work? Cover cubicle walls temporarily with purple, green or gold fabric and trim them with strings of beads. Let each employee create a supersized mask to cover the opening of their cubicle and create a sense of mystery. Post a list of clues in the break room that will help your employees find the king cake you’ve hidden somewhere in the office. Leave coins and other trinkets in desk drawers for employees to find. Have an office-wide treasure hunt that has a hand painted coconut as the reward. Name a king and queen of the office and request that everyone refer to them by a formal title for a day. Those itty bitty corner desks are a valuable space saving workstation option when your square footage is limited. These are a popular item for home offices where there isn’t a full room that can be a dedicated workspace. But don’t these mini-desks seem out of place in a traditional office setting? That depends on how you use them. These aren’t words any employee wants to hear. A corner desk doesn’t exactly have the same cachet as a corner office – especially since there usually isn’t a view. Office workers pay close attention to how much “real estate” each of their coworkers gets. Being given a tiny desk tucked in a corner could be a blow to employee satisfaction. However, the size of the desk is just part of the problem. The other big issue is that the worker has to sit with his back to the room. That can feel pretty exposed. No one likes imagining that other people can sneak up on them or look over their shoulder all the time. Then again, if you put a freestanding cubicle panel behind them, it would feel pretty lonely in the corner all alone. So, as a substitute for a regular cubicle with an L or U shaped desk, this design is a non-starter. On the other hand, corner desks do make an attractive addition to an office if you have a few workers who are usually mobile and just visit headquarters occasionally. They can use one of these mini-workstations as a touchdown point. Since they’re probably using a laptop or a tablet anyway, the limited surface area and lack of storage space aren’t a problem. The placement can also be ideal for side by side viewing of a monitor by two or three people. So, a corner desk could well turn into an activity hub for impromptu brainstorming sessions or short presentations. If you install a couple of adjustable tablet holders, you could turn the corner desk into an interactive center for your office! At The Office Furniture Planning Group, we don’t just have designers, planners and installers on hand to serve your needs. We’ve also got a project management team to make sure everything happens when it’s supposed to happen. These folks don’t get the glamorous limelight, but they pull all the strings behind the scenes to ensure your office furniture project outcome meets or exceeds your expectations. A PM is the person who keeps track of all the various aspects of your furniture shipments. Their job is to get the job done in a timely fast – and help save you money in the process. For example, they know how to review and compile your furniture order so freight is routed in the most efficient manner. In some cases, that might save you money on trip fees, pickup and delivery fees, handling fees and fuel surcharges. Of course, if a particularly critical piece is on backorder, they can also negotiate for a “hot shot” shipment to get it here on time so your installation isn’t delayed. If there are any unavoidable changes in the schedule, your PM gives you the heads up so you can decide how to proceed. If we are doing our job right, you’ll never even know about half the bumps in the road we smooth out on the way to getting your office furniture installed on time and within budget! Delivery of Office Cubicles: New Orleans, Here We Come! We receive product from manufacturers at our own facility for your project. If you are outfitting a new or renovated office space, you could be purchasing from half a dozen different manufacturers or more. There might be one shipment coming in for cubicles, another for seating, one for filing and storage furniture, one for lighting, and so forth. Besides being very confusing, managing all these shipments is time consuming and space intensive. The last thing you want is to have to try to find somewhere to stash 50 cubicles that arrive while you are in the middle of carpet or tile installation. Then there’s the little matter of damaged or incomplete shipments. If you aren’t on top of every package, you might well miss signs of rough handling or a mismatch between the BOL and the actual shipment contents. If you do notice something amiss, navigating the labyrinthine process of making a freight claim is enough to make you tear your hair out. You need to leave that hassle to the professionals. We don’t put up with being bullied, given the runaround, or otherwise ignored. You will get what you paid for in good condition – we won’t accept anything less on your behalf. What about when it is time to put everything together? We transport your office furniture to your location. There, we uncrate and stage it (while removing any packaging). Staging is actually a very important step that often gets overlooked in installation. It takes years of experience handling office furniture projects to understand the most efficient order to follow in putting together modular furniture and accessories. Organization is what makes this a completely smooth operation. If you’ve ever done a home improvement project and ended up going to the hardware store 5 times before the darn thing was over, you know what a difference good pre-planning makes!